Most people have bought a lottery ticket at one point or another. We all know the odds of winning makes each ticket purchase a questionable economic action, but we do it anyway. In part, we’re paying for a nudge to the imagination. We ask ourselves: What would I do with millions of dollars? We imagine something fanciful and wonderful, something like buying a superyacht and taking all of our friends on an around-the-world tour. What we don’t imagine is winding up worse off than we already are, but this happens more often than one might think. Lottery winners aren’t the only recipients of easy cash. Athletes, actors and even tech billionaires have been known to suffer as a result of sudden wealth. Here are six reasons you don’t want to get rich. Though commonly discussed, the tax problems associated with landfall riches are real. Federal taxes on lottery winnings are 39.6 percent. Only 25 percent is actually withheld for federal taxes. Oftentimes the state also demands a chunk of winnings. Local taxes might apply. If you decide to share your winnings, that generosity will not include a lessening or sharing of tax obligations. While this is no reason to shun a lottery win, it is certainly something to keep in mind before hitting the Bahamas on a spending spree. For those billionaires that actually earn their money, the US tax bracket is 39.6 percent. That said, they rarely pay that amount. Their lawyers are less expensive than the taxes they dodge. It may be a cliché, but it’s true: money can’t buy happiness. Though people report increased happiness levels immediately after the win, they are actually less happy in the long run. Why? Apparently winning the lottery makes mundane, everyday events less pleasurable. Sudden wealth syndrome is a well-documented phenomenon. It’s what often happens when someone unaccustomed to large sums of money suddenly finds themselves with an unprecedented amount of cash. They spend it on ridiculous things. Multiple homes, fancy cars and terrible investments are par for the course. According to one study, 44 percent of people who win the lottery are broke five years later. A third actually declare bankruptcy. Sports Illustrated estimates that 60 percent of NFL players are dead broke just five years after their contracts end. Better to work a regular job and have money for your bills than find yourself unemployed and filing for bankruptcy. A survey of thousands of lottery winners found that women who won a large amount were 40 percent less likely to marry in the next three years than those who won lesser amounts. Different papers have read this in different ways, with some reporting the woman can’t find love and others assuming that they are enjoying the single life. Despite many examples of couples who have divorced following lottery winnings, studies find no correlation between divorce and a lottery win. Several accounts point to dissolving friendships as once-trusted comrades become shameless leeches. Interestingly, murder by loved ones isn’t off the table. William Post the Third had a hitman after him following his lottery win. The would-be killer had been hired by his brother. Ibi Roncaioli was poisoned by her husband. Urooj Khan died of cyanide poisoning the day after collecting his lottery winnings. He had just finished dinner with his wife and daughter, who split the winnings. If you manage to pay off your taxes, spend wisely, and keep your relationships happy and healthy, you may still find that sudden wealth turns you into a person the old you wouldn’t much like. This is especially true of people who have earned their riches. Being an actor, athlete or rapper certainly takes talent, but these people don’t work as hard as those supporting a family on minimum wage. Nor do they possess the skills of a rocket scientist. Arguably, our society overvalues their services and provides them with heavily inflated wages. These inflated wages sometimes lead to an inflated ego. I would really like to use Kanye West as an illustration, but it turns out he thought himself god-like before making any money at all. There are still plenty of examples. Justin Bieber, Katherine Heigl and Madonna are just a few top performers who are known to be particularly unbearable. Tech billionaires also fall into this trap of fortune. Many a tech billionaire arrived at their fortune through a bit of talent and a lot of luck, but success quickly goes to their heads. Take Mark Cuban, for example. He sold a tech company to Yahoo for $5.7 billion in 1999. Recently Cuban boasted that he could beat Hillary Clinton and “crush” Donald Trump if he ran for president. 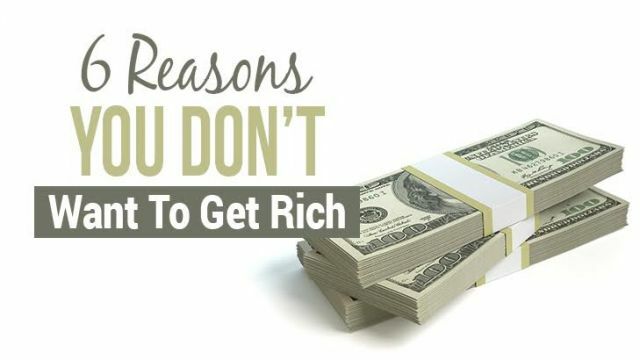 Hey Buddy!, I found this information for you: "6 Reasons You Don’t Want To Get Rich". Here is the website link: https://www.thealternativedaily.com/reasons-you-dont-want-to-get-rich/. Thank you.